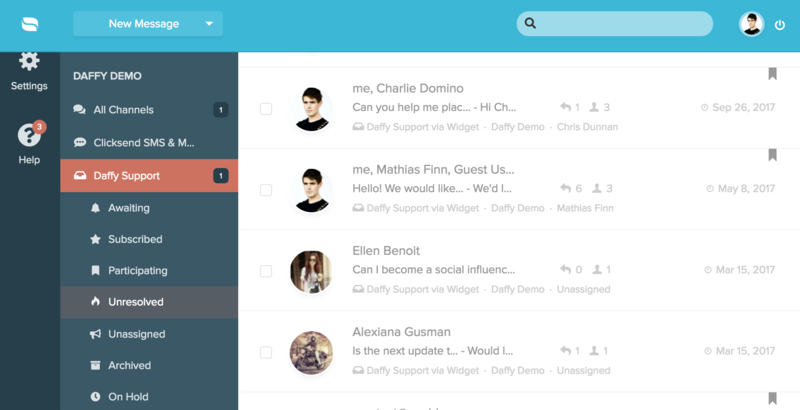 The main dashboard (also known as the main inbox) is where all of your customer conversations live. It's also the main view you'll be using on a daily basis to interact with all of your Re:amaze brands, the channels that belong to those brands, view filters, tags, and other features like reporting, articles, live dashboard, contacts, quick actions (such as reminders, merging conversations, running workflows, moving conversations) and bulk actions. 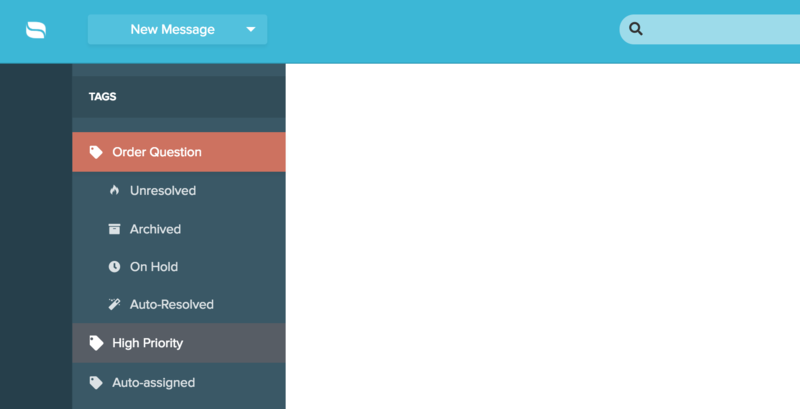 In short, the main inbox dashboard is your friend! Before you read on, make sure to read this article about sorting. 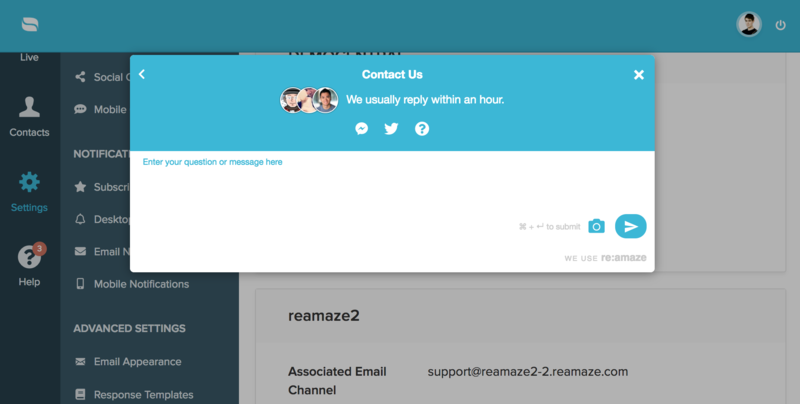 Clicking on the "Inbox" button or the Re:amaze logo will always take you to the main dashboard. Re:amaze remembers (sticky) which view filters (discussed below) you were previously using so don't be alarmed. To release the sticky, simply click on "All Conversations" in the view filters list. Chats is a Plus Plan feature that enables classic live chat features such as customer queues, live chat office hours, and session based messaging. See this article for how regular live chat (also known as real time messaging) differs from classic live chat. Clicking on "Reports" will take you to a list of enabled reports for your account. Reports are key metrics collected and calculated to give you or your teammates an overview into the overall performance of your customer service team. To learn what each report means, see this article. Clicking on "Articles" will take you to the FAQ area of Re:amaze. This is what you'll use to create and organize your frequently asked questions content. To see how to create and use your FAQ, see this article. The Live Dashboard is a Plus Plan feature that enables you to browse for customers that are currently online. Clicking on "Live" will take you to this dashboard. To see what the Live Dashboard looks like, see this article. Clicking on "Contacts" will take you to Re:amaze CRM. It's a repository of profiles for every customer that has ever contacted you whether through email, live chat, social media, or SMS. Clicking on a contact profile will show you the customer's various identities, conversation history, data attributes (customer notes), and other relevant integration data. See this article for more. Quite self explanatory this one is! 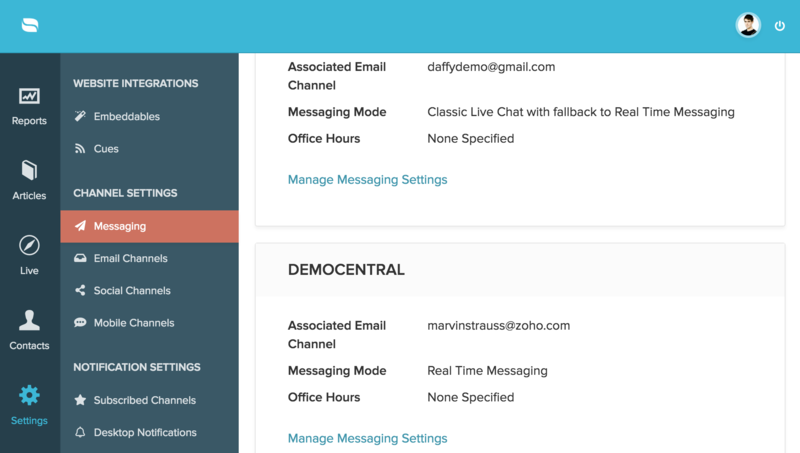 You can access the settings menu where you can manage things such as channels, staff, brands, notifications, and much more. Need to find us for help? Click on the Help icon and access our FAQ instantly. Can't find what you're looking for? Click on "Contact Us" to message us directly. Filters show you what you want to see, plain and simple. And instead of using custom views like Zendesk or Freshdesk, Re:amaze approaches conversation management in a more fluid and more consistent manner for all staff members. Every staff member has access to the exact same core filters. The pros to this approach is that it's immensely useful to coordinate with team members on how to find something or see something. This also means less confusion. The con is that it is a little less flexible than custom views. The main filters are: All Conversations, Awaiting, Subscribed, Participating, All Unresolved, All Archived, On Hold, Auto-Resolved, Outbound. To read about the various conversation states that affect these filters, see this article. All Conversations shows you every single conversation (both unresolved/open and resolved/closed) in chronological order and should be the first place you start your day. Our recommendation is to use the "All Conversations" filter to get a glimpse into your overall workload because it'll be in context of what has arrived before. Awaiting is a smart filter that, by default, shows you unresolved conversations that are either unassigned or assigned to you. This smart filter also utilizes machine learning and surfaces conversations (regardless of channel) that most urgently require your attention. This algorithm is based on a combination of timestamps, thread size, message volume, and message frequency. We highly recommend learning to rely and trust this filter when it comes to helping customers. Being that the awaiting filter does not treat any particular channel with more priority than others, it allows you to help customers equally and without prior biases. Subscribed is a filter that shows you only conversations from channels that you've subscribed to in reverse chronological order. Reverse chronological order means that the customer who has been waiting the longest will appear on top. Participating is a filter that only shows you conversations that you're a participant of. This means if you have at least one reply in the conversation, or if a note is addressed to you, or if you're assigned to the conversation, or if you've clicked on the "Follow" action. Only unresolved conversations will show up here. All Unresolved is a simple filter that shows you, well, unresolved conversations only in reverse chronological order. It's a quick access to see what is still pending and what requires attention. We recommend using this filter as a day-starter if you don't like seeing a cluttered inbox provided by the "All Conversations" filter. 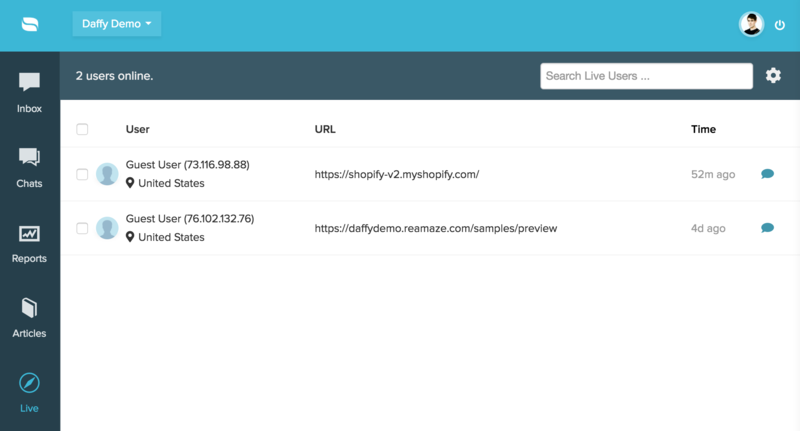 Your Re:amaze channels appear right on the dashboard under the respective brands they belong to. If you only have one brand, then only one brand will show. Clicking on a channel filter will show you conversations that belong only to that channel. This is the recommended method of filtering out specific types of conversations such as emails, Facebook messages, Instagram comments, Tweets, or SMS messages. Keep in mind that live chat (real time messages) conversations that originate from your embedded website widget is always tied to an email address on the backend. Clicking on the right email channel filter will help you locate these conversations. Another thing to note is that each channel filter has the same subset of state filters just like the main dashboard. Are you a customer service team member that only works on conversations that are assigned to you? If so, your personal assignee filter is where you want to start your day. It shows all conversations (both resolved/closed and unresolved/open) that are assigned to you in reverse chronological order. Tags can be thought of as labels or folders. Clicking on a tag filter will show you conversations that belong to that tag and that tag only. See how tags work in this article. Tag filters also have a subset of state filters to help you more easily navigate to certain types of conversations. Re:amaze supports both quick actions and bulk actions in the same easy to use interface. 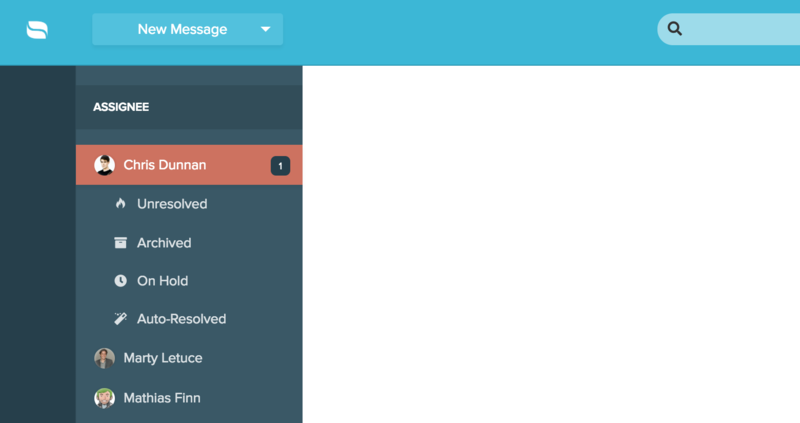 Select one conversation on the main dashboard to enable the quick actions menu. Select multiple conversations on the main dashboard to then see what bulk actions are available to apply. You can reply to conversation(s) without opening the conversation if you already know what it's all about. Simply check one conversation to reply or check multiple ones to send the same reply to multiple conversations. You can resolve one or multiple conversations if they're both currently unresolved. If one or more are in a different state, the bulk resolve action will not be available. You can reassign one or more conversations to different staff members. You can archive one or more conversations. You can set a reminder for one or more conversations. Marking as spam is an email only feature. If you check multiple conversations, make sure they're all from email channels. This feature will not appear if you check conversations from various different mediums. You can follow one or multiple conversations. Following is the same as participating. This bulk action is only available if the checked conversations are not already followed. You can move conversations that belong to certain email channels into another email channel. Social media and SMS conversations cannot be moved. Manual workflows can applied to one or multiple conversations. Learn more about workflows in this article. For those of you that are quick with your fingers, keyboard shortcuts can be a godsend. 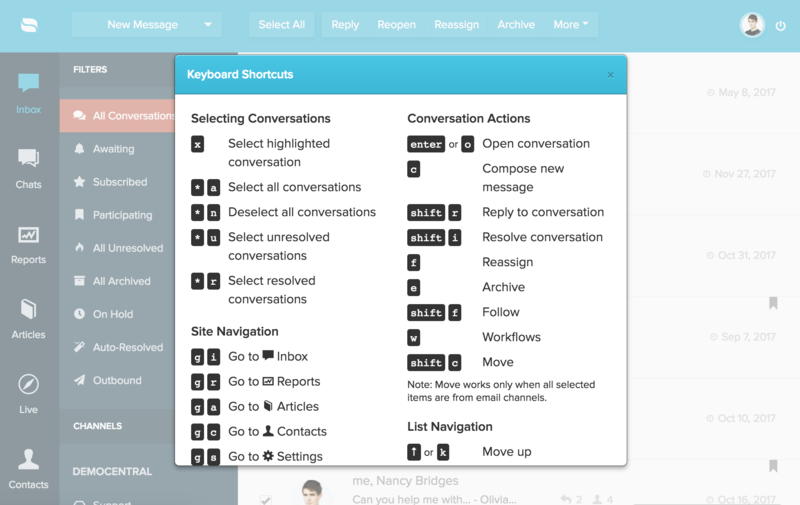 Re:amaze supports keyboard shortcut access just by hitting "? ".